The Olympic Park is to get the same postcode as the BBC soap opera EastEnders, the Royal Mail has revealed. The site, in Stratford, will receive an E20 code - which is currently used by the fictional district of Walford in the TV series. The postcode will serve five new neighbourhoods to be created after the 2012 Games. 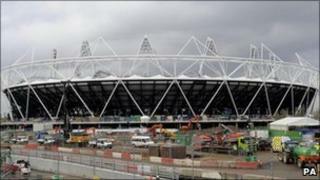 The Olympic Stadium will get its own E20 2ST code as part of the change. More than 100 postcodes will be assigned to developments throughout the site - which will be renamed the Queen Elizabeth Olympic Park after the Games. London's first postal districts were introduced in 1857, while the current system using numbers and letters was created in the late 1950s. The E20 postcode for the Olympic Park will also cover neighbouring areas including the residential apartments in the athletes' village plus the Westfield Stratford City shopping Centre which will house 400 retail units. The postcodes will be split into three zones - E20 1, E20 2 and E20 3. Zones 4 to 9 could be added in future decades as the site develops. Up to 8,000 homes will be built there over the next 20 years. Stephen Agar, Royal Mail's director of regulated business, said: "It is fitting that such a significant development in London has been allocated its own easily recognisable postcode more than 150 years after the world's first postcodes were introduced in the capital." Walford, the fictional suburb of East London where EastEnders is set, was given the E20 postcode when the BBC launched the soap opera in 1985.